We used to say this to my 2nd graders en lieu of sitting "Indian Style", which has been banned from use in the public school system. I thought it only appropriate to introduce my topic of discussion--the cross body bag. Now, growing up as a kid, I distinctly remember my grandmother and other older motherly figures wearing these PURSES. I detest the word. It makes me think of those horrendously unattractive bags of the '80's and '90's. Yet here I find myself blogging about a version of a bag that I once found repulsive. I hate carrying things. Aside from my Louis Vuitton Speedster, all of my bags are shoulder hobos, which still requires you to occasionally readjust as they tend to slide down your shoulder. Enter the cross body. No more worrying about holding things or slippery shoulders. They're coming in all sizes these days, even teensy tiny ones like this studded out badass one from Gap. Black and gold have to be my favorite color combos when accessorizing, but who can resist a little silver and brass thrown in there as well? All the mixed metal makes coordinating your jewelry that much easier. Comparable to a mini-sized wallet, there's just enough room in there for your cards, iPhone, and chapstick. What's not to love? 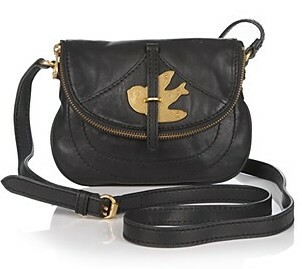 Aside from this unique cross body, my other craving comes from the one and only Marc by Marc Jacobs collection. 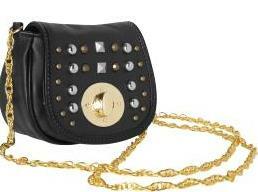 The 'Petal to the Metal' cross body is a great staple, and slightly more toned down in a bigger size than the Gap bag. With great detailing like the gold dove and highlighted stitching as well as a bold zipper to accent the dove, Marc has simply created yet another understated bag that will last a lifetime.